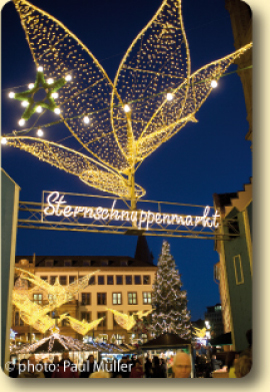 When the colours blue and gold take over the scene in the cosy light of the pre-Christmas season and transform the place in a miraculous way, then the time has come for the “Wiesbaden Twinkling Star Christmas Market”. At the Schlossplatz in Wiesbaden, amidst the picturesque setting of the impressive parliament building of the Hessischer Landtag, the town hall and the stately church Marktkirche, more than 130 stall-keepers offer their goods to delve among, discover and taste, every year over the four weeks before Christmas. 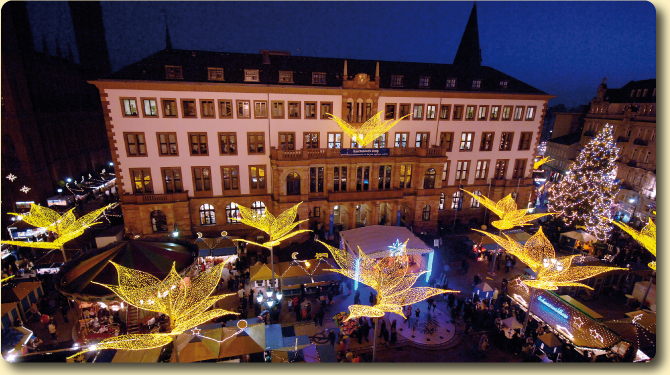 Brightly lit ten metres high lilies, the symbol of the Wiesbaden city coat of arms, are pointing the way to a world full of artistic craftwork, ceramics and glass art, as well as culinary treats and tempting rides. A particular eye catcher is, next to a Christmas crèche with life-size figures, the Christmas tree in front of the town hall, shining with the light of about 3,000 environmentally friendly light-bulbs and decorated with about 1,000 blue and golden ribbons. A very unusual view of the state capital provides the Ferris wheel, which is erected on the Mauritiusplatz in der pedestrian zone: Discover Wiesbaden in the pre-Christmas time from a height of 40 metres, and see more than 70 brightly lit lilies spread all over the pedestrian zone and Wilhelmstrasse. Another highlight in the pre-Christmas period is the “ESWE Eiszeit” with its around 800 sqm ice rink and two curling rinks in the Warmer Damm park in front of the Hessian State Theatre. Here stalls decorated in a wintry, Christmas style invite you to train for the winter activities and take a break between skating circuits. 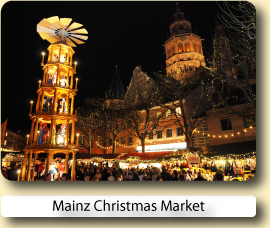 The food stalls offer mulled wine, crepes and grilled delicacies, and in addition, the ca. 100 sqm ski lodge is back again this year to warmup in. 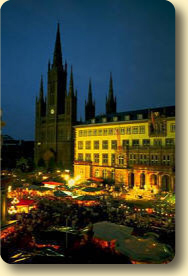 Wiesbaden is variously described as the "Nice of the North", the gateway to the Rheingau, or the city of villas. The city has an illustrious history as a health resort due to its hot springs. The glorious architecture of the Wilhelminian era, lush parks and gardens and a wide choice of cultural events are the prominent features of this elegant city on the Rhine. Wiesbaden's focal point and main landmarks are the spa assembly rooms and the elegant casino, which was built in 1907 under the aegis of Kaiser Wilhelm II. The area near to the spa assembly rooms has many restaurants, offering fine dining in elegant surroundings, one such example is the Käfer’s, inside the spa centre. 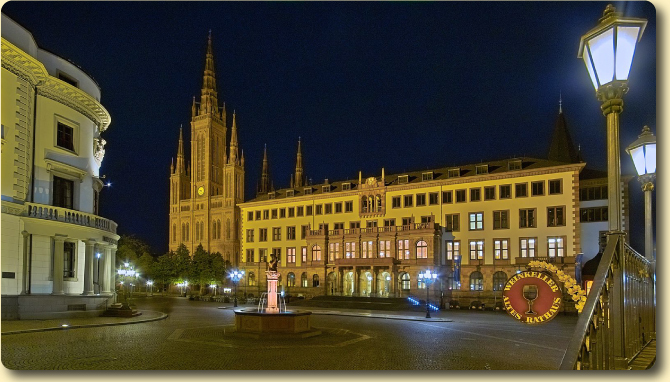 Other highlights in Wiesbaden include the Hessian State Theatre, the impressive old and new town hall plus the historical old quarter, with its former palace, which today is used as the seat of the Hessian state parliament. In addition visitors will be able to discover further architectural splendours, such as a Russian Church on the Neroberg hill, a neo-Gothic Market Church as well as the baroque Biebrich Palace on the banks of the river Rhine. For eating out traditional regional dishes are served at a variety of restaurants in the old quarter, including at the Dortmunder and Weinhaus Kögler. The lively Goldgasse is lined with restaurants offering a wide range of international cuisine. 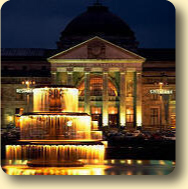 Nice hotel located within an easy walk to the Kurhaus, central square, tourist information and many restaurants. Modern, average size room, and a very nice bathroom. The hotel was located within walking distance of downtown. Very beautiful location across from a large park. The hotel was very accommodating to international guests. The staff was friendly and helpful. The rooms were clean and comfortable. The location near the downtown area made it very convenient to walk to almost everything. Our room was spotlessly clean and large, though a bit dated. Our beds were very firm, and the interior courtyard side of the hotel is quiet, though the train station is less than 200 meters away. 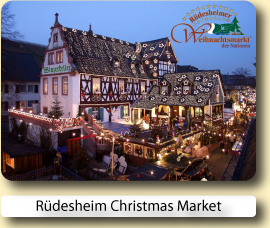 Buy a one day German Rail Länder Ticket and you could explore all the Christmas Markets in the state of Hessen for one amazing price of: One passenger: €32 Extra person: €0 Unlimited travel, one price, through out Hessen (see map above) for up to 5 people, 9 a.m. until 3 a.m. of the following day and on Saturday, Sunday and bank holidays from 0a.m. until 3 a.m. Valid on all local trains (Interregio-Express, Regional-Express, Regionalbahn, S-Bahn). Prices quoted are for 2017 ticket machine purchases only. 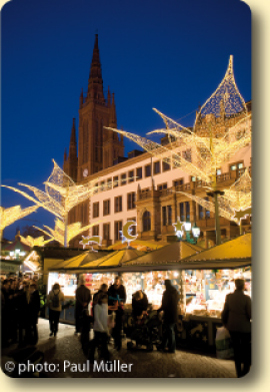 Book your hotel for the Wiesbaden Christmas Market with Expedia or Hotels.com.Both online reservation services will let you compare and book hotels at great low prices.